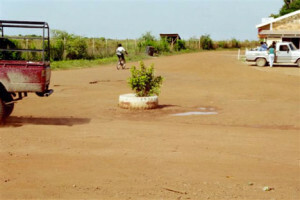 Home » Blog » Is This the World’s First Modern Roundabout? I came across this roundabout picture approximately 15 years ago and decided it was the world’s first modern roundabout—at least the first one in this particular part of the world (and certainly the first one at this intersection). I keep this picture on the wall next to my drafting table to provide inspiration when designing roundabouts. Now the Federal Highway has since published something they call “design guidelines” however this particular picture remains my go-to. I consider this roundabout “modern” because of the fresh paint on the tire plus it appears to be bicycle-friendly. Also, the central island feature is not only low maintenance and very beautiful but satisfies all site distance criteria known to man. Note also the perfectly painted red arrows clearly indicating a clockwise circulation pattern. This tells me the location is likely in the southern hemisphere—probably Antartica or maybe Australia—but I’m not sure (the Coriolis Effect on traffic flow is still under debate). It could just be my imagination, but as someone who hales from the northern hemisphere, I generally feel compelled to drive counter-clockwise within roundabouts (but not always).